I suspect everyone is familiar with the proverb, ‘For want of a nail’. Ferm had made a good start to the session, picking up 18 IMPs bringing the score to 73-104. 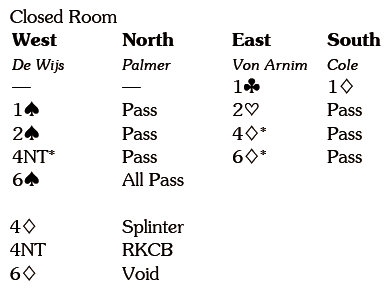 4 was in no danger and declarer took eleven tricks. 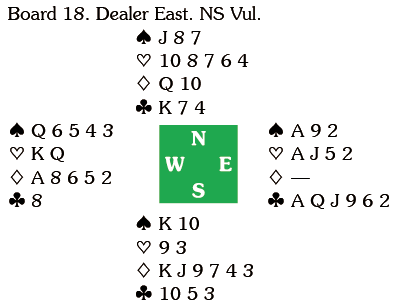 North led the 4 and declarer won in hand, ruffed a diamond, cashed the A and continued with the nine, South winning with the king and exiting with the J. Declarer won with the ace, drew the outstanding trump and played the 8. He knew South had started with the K10, the ]9 (and almost certainly a second heart) and KJ9743. Who had the K? 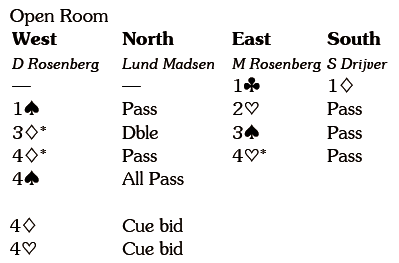 The odds surely favoured it being with man who had overcalled and declarer went up with dummy’s ace and ran the queen. That represented a swing of 22 IMPs and a huge loss of momentum. For want of a King, the battle was lost.